Chickadvisor is looking for product testers to give Carnation Breakfast Essentials a try for free! 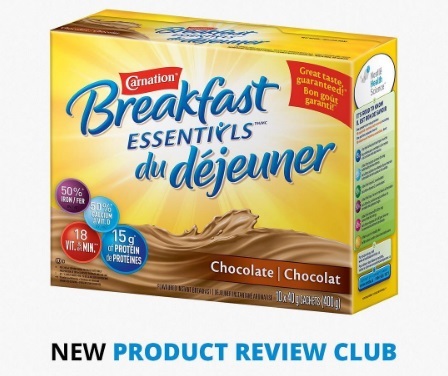 200 Canadian women to try Carnation Breakfast Essentials in Chocolate or Vanilla flavour. You have until January 10, 2017 to apply. Selected members will be contacted by email within a few days of January 11, 2017. Remember to add "PRC@ChickAdvisor.com" to your email address book to ensure that you receive all future communications! For extra consideration make sure you spread the word on social media and remember to include #CarnationBreakfastEssentials when you post on Twitter, Instagram and Facebook. Good luck Chicks! Not a Chickadvisor Product Review Club member yet? Click here to sign up! Then write at least 5 reviews (of product that you've recently bought yourself and tested) for your best chance to be chosen for future campaigns! Click here to sign up for this product review offer.